Shakshoukeh (or shakshuka) is the kind of dishes that can be prepared and made anytime, by anyone, and using the most basic ingredients that any kitchen would have. It basically consists of two ingredients: tomatoes and eggs, but extra ingredients can be added according to the preference of the cook like garlic, onions, green peppers, cheese and meat. 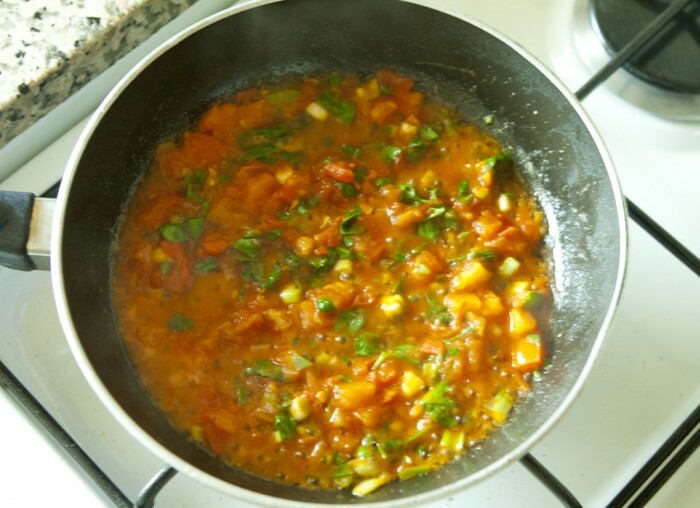 In this recipe, I’ll be using tomatoes, eggs, green onions, parsley and tomato paste for a thicker sauce and more concentrated tomato flavor. 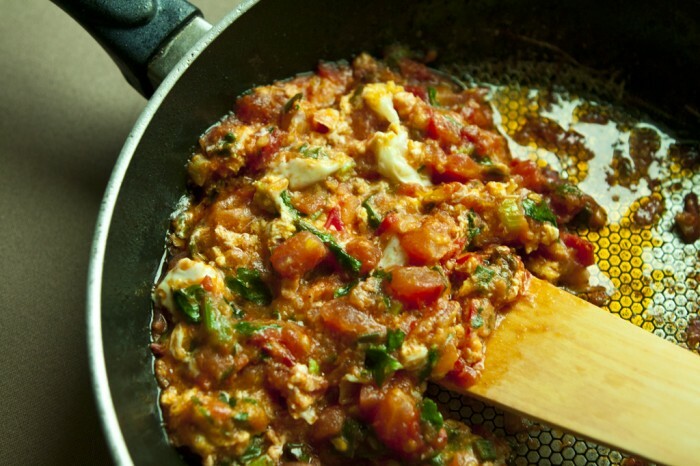 Shakshoukeh has started as a meal for workers, farmers, fishermen, and poor people in general; and this (in addition to it’s fresh and deciduous taste) made it a very popular dish not only in Palestine but in the whole Arab region. It’s called shakshouka in the countries of north Africa (where it’s originally from), jaz-maz in Syria, makhlama in Iraq, and some people would simply call it eggs and tomatoes. 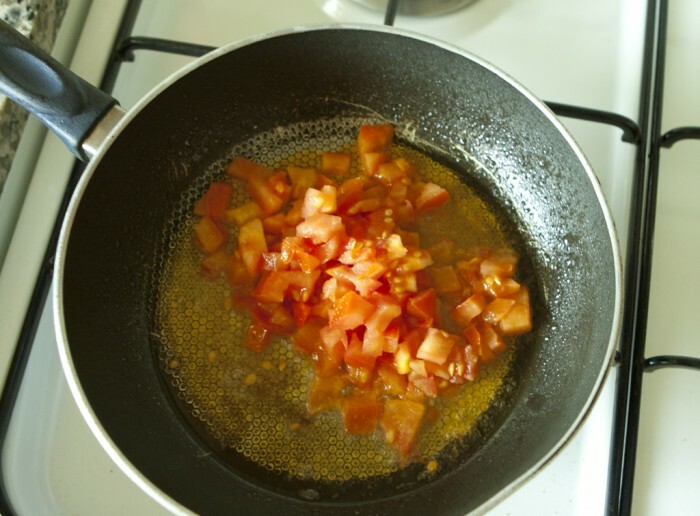 Heat vegetable oil in a small saucepan. Add tomatoes, salt, pepper mix, and chili pepper. Cover the pan and let simmer over a reduced heat for about 10 minutes or until semi cooked. Stir from time to time. 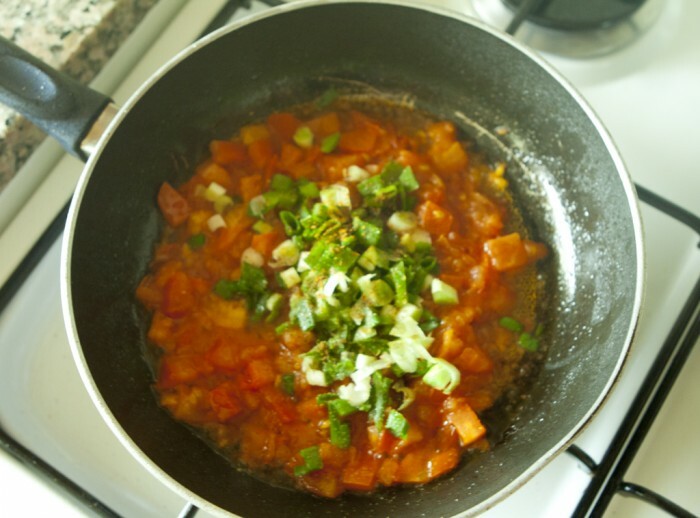 Add ¼ cup of water, green onion, parsley, and tomato paste to the semi-cooked tomatoes. Leave on a reduced heat for another 2 minutes and keep stirring. 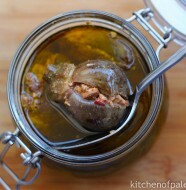 Add the egg and the olive oil and wait for only a minute until the egg is slightly cooked. Scramble the mixture a little for less than a minute and Serve hot with pita bread or any other bread of your choice. 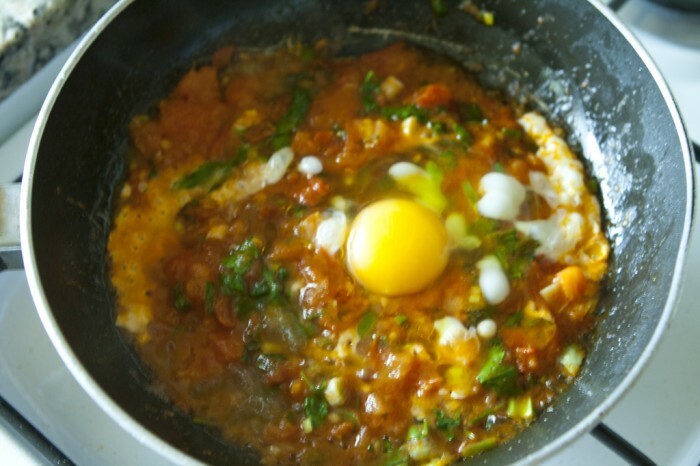 16 Comments on "Eggs with Tomato Sauce (Shakshoukeh)"
Thank you so much Rawan :) kisses to little Teeba.. Thank you Nisreen.. yalla it’s time to make them all ;) kisses to ur trio..
Oh my God.. zamaaaaan ma akalt shakshoukeh! thanks for reminding me about it.. will do it hal yomein..
Shakshoukeh is addictive! You do it once, you end up doing every other day.. Tell me how it goes! I have tried cooking this for my family the other day, and it was amazing! We used to prepare shakshoukeh in the past, but this recipe turned out differently. The tomato-to-egg ratio and the addition of tomato paste made a great impact on the taste. I’m definitely repeating it again. I learned to make it from a friend, who told me it was a spanish recipe…eggs poached in tomato sauce. I make my sauce with passato di pomodoro with bell pepper and courgettes, and add some lemon juice, sugar and chilli…yours sounds like a variation I’ll have to try soon! 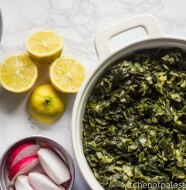 I discovered this website by accident and I am finding so many great recipes I will surely come back! Shakshuka is a North African dish. It means a mix in their slang. It’s spread and became known throughout Spain and East Mediterranean region. The Spanish version sounds interesting, I’ll try it! This dish brings back warm memories of my time in Hebron when the Palestinian family I stayed with prepared this yummy dish for me for breakfast! 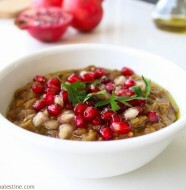 I hope you will get the chance to come back to Palestine and try many more dishes.